This is a Tycos 3132 Biram anemometer made by Taylor Instrument in the USA (not Short & Mason). Biram anemometers are not really weather instruments since they're directional, they were used to measure air flow in mine shafts, ducts, and the like. 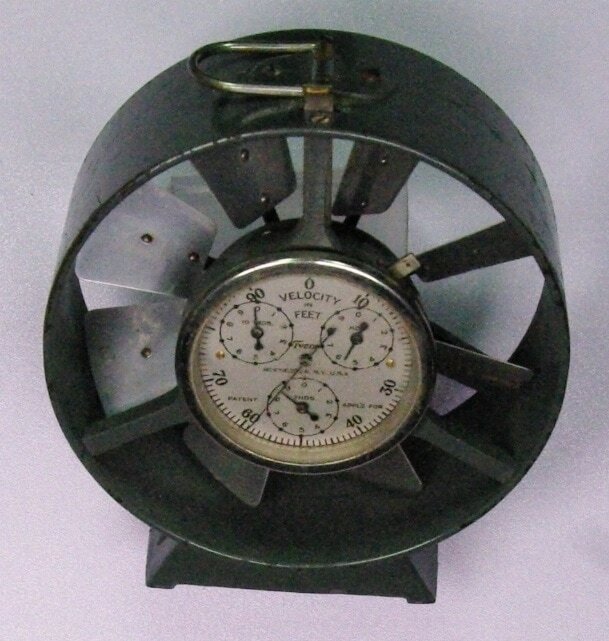 It is a totalizing anemometer in that it measures air flow in feet. If it is operated for one minute and a reading is taken, it indicates the average air speed in feet per minute. It has a reset button on the side of the dial. It is shown in the 1929 Tycos catalog and 1936 Taylor catalog which are available for download on this website. Go to Taylor/Tycos catalog page.